Well, what do you know? I was able to complete two cards again today as well! Now I'm all caught up on this week's Mojo Monday cards. The sketches have been fun to work with and surprisingly, both of these cards came together rather quickly. I think that's because there wasn't a lot of stamping involved with either of them. I knew that I wanted to try to do both of them this morning, so I try to limit the work involved in creating each of them. The first card is for yesterday's #3 sketch. 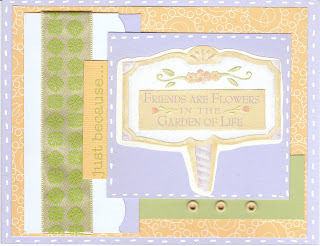 For this card, I decided to use a sticker from a K and Co. sheet tha t I had for my focal image rather than a stamp. I started with a 4 1/4 x 11 Almost Amethyst base, which I folded sidewaysand then layered a piece of yellow patterned paper from SU. Next I added some light yellow eyelets to a strip of celery paper and attached it just about the bottom of the yellow piece. I found a piece of pale pale purple in my paper stack that worked great with the coloring in the sticker and used my corner rounder to make a scallop edge before attaching it to a strip of Amethyst paper. The ribbon is from chatterbox and the "just because" sentiment is from my Hero Arts "Everyday Sayings", a set that I am totally totally loving right now! Finally, I added the white stitching around both pieces of the Amethyst paper. My second card is for today's #4 sketch. Truth be told, this card came together even quicker than the first. I knew that I wanted to use this piece of scrap from SU's Pink Flamingo collection that I had. I also knew that the paper was so busy, that I wanted to do a center element that was simple and clean. I started with a standard 5 1/2 x 8 1/2 piece of Ruby Red card stock and then layered a piece of Cameo Coral. Then the patterned piece of paper with a small Ruby Red border at the top and bottom. I added the strips of Summer Sun to the top and bottom next, followed by the Turquoise piece in the middle. 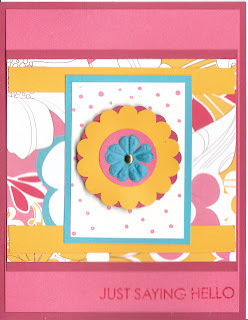 I stamped the white piece in the middle with itty bitty backgrounds in Coral ink and added the scallop circles and prima flower in the middle. Finally, the sentiment on the bottom stamped with Ruby Red ink is from (say it with me now!) Hero Arts "Everyday Sayings"
Anyhow, I hope you enjoy them. Can't wait to visit everyone and see what lovely creations you've all come with. Have a great day! What awesome cards---you have been busy-Girl! Both cards have wonderful color combinations. TFS! Both cards are beautiful Dori, you rocked the mojo sketch and your sketch card is VERY pretty! Thanks for appylying to the OCC! i love the colors and sketches youve chosen TFS! Aloha with OCC and WSC! Wow! Two Cards in One Day! Sometimes it all just works.